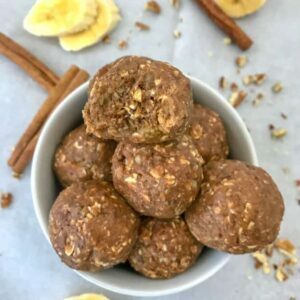 If you’re a fan of banana bread, then you’re in for a real treat with these No-Bake Banana Bread Bites! 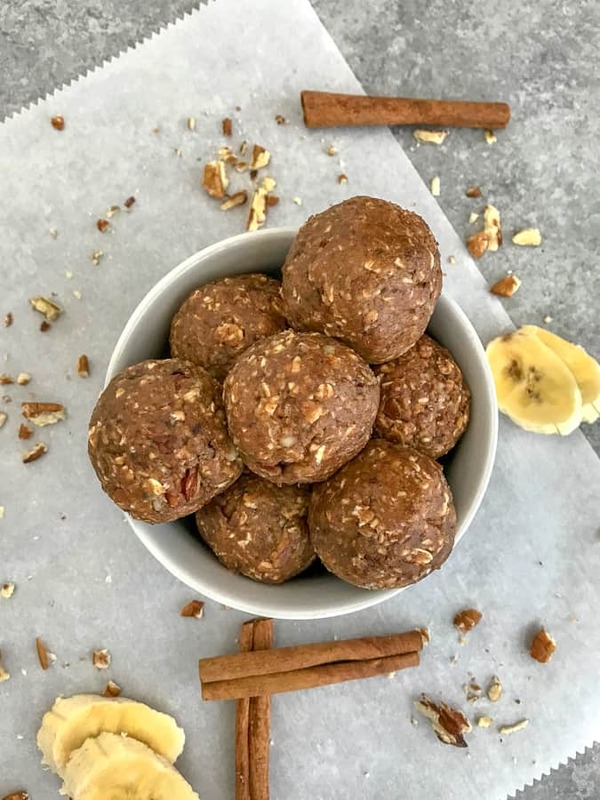 Easy, delicious banana bread bites that come together in 10 minutes and require no baking. 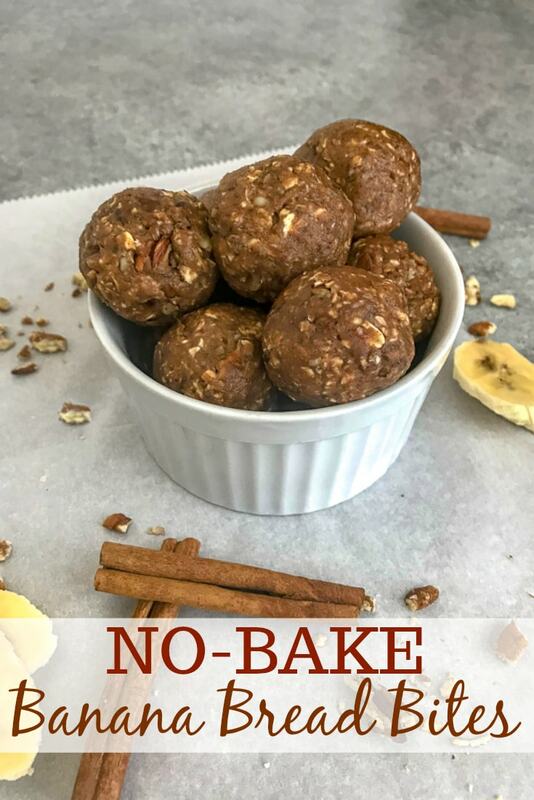 These make for a simple, healthy snack or treat anytime of the day. Perfect make-ahead option! 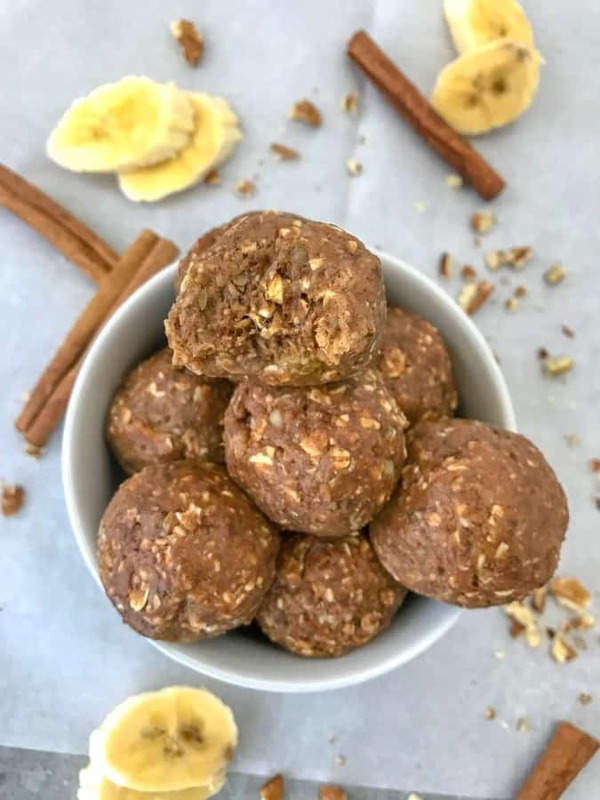 These Banana Bread Bites take take less than 10 minutes to make and are a great recipe to prep ahead of time to have on hand as a snack or treat to help you curb your sweet tooth cravings! They are perfect for those overripe bananas that are sitting on your counter needing to be used. Love banana bread, but hate the effort and time that it takes to make and bake one? Yeah, me too! So try these to feed that craving! I must admit, these are my go-to when I need a quick and easy fix. I prep them for a few days and have them on hand as I am running out the door. If you store these in a container or sandwich bag, they are great as a breakfast or snack to grab-n-go. As far as breakfast, they pair well with a cup of coffee! Combine all ingredients, minus pecans, into a food processor and process until thoroughly combined. Place into the fridge, covered, for 15-20 minutes to thicken up. Using a 2-tablespoon cookie scoop, roll 15-16 balls. Store in an airtight container in the fridge for up to 5-7 days. 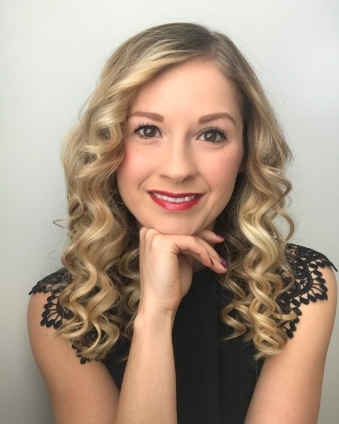 Freezer: Store the bites in a freezer-safe container or bag for up to 1 month. Cookie Scoop – this makes portioning and rolling so much easier! Food Processor – this brand is my favorite. I have had one for 8 years now. Parchment Paper Sheets – no measuring or cutting needed! Simply pull and use. Glass Food Storage Container – fridge and freezer-friendly. 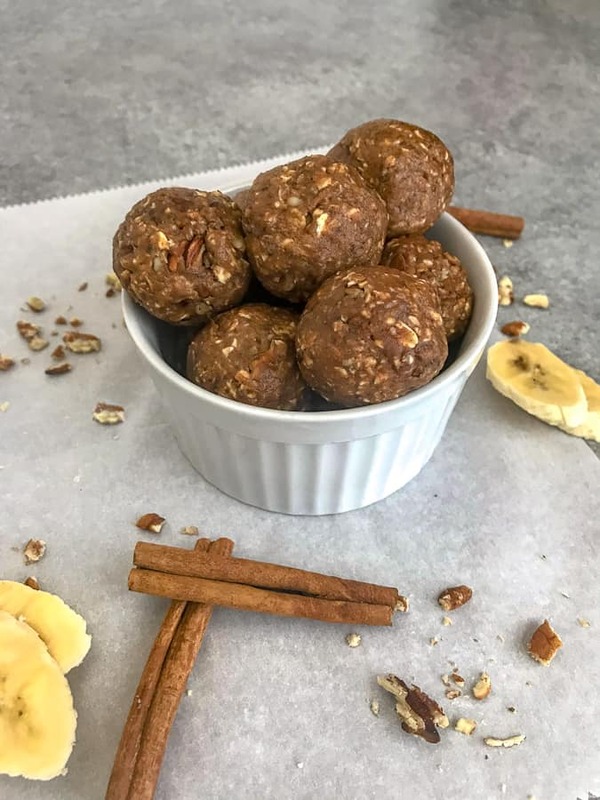 Using a cookie scoop truly helps to not only roll these balls, but also to get even portions. These are freezer-friendly. Store in an airtight container or freezer-safe bag for up to 1 month. Fridge – up to 1 week. Parchment paper is great for separating these if you need to stack them in a small container. If the mixture seems dry, add 1-2 tablespoons of maple syrup (or honey) or almond butter. If it seems to be too dry, add a little extra oatmeal. The balls should be firm and chewy, as well as a little sticky. These bites tend to be sticky, so placing them in the fridge helps to firm them up a bit, making rolling easier. 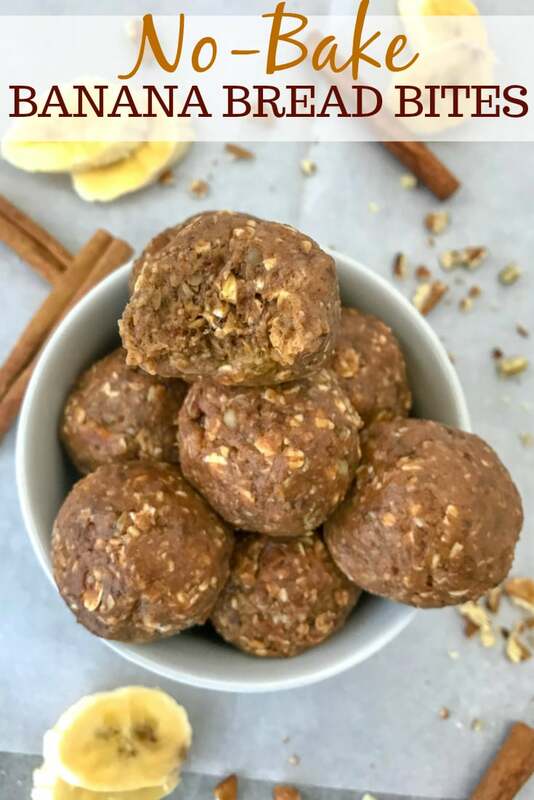 These No-Bake Banana Bread Bites make for an easy and quick make ahead snack or treat that will help you curb your cravings! Freezer-friendly, as well as kid-friendly. Combine all ingredients, minus the crushed pecans, into a food processor and process until thoroughly mixed and thickened. 2-3 minutes. Refrigerate for 15-20 minutes to thicken, if needed to thicken. Using a 2-tablespoon scoop, roll out 15-16 balls. Squeeze firmly together, if needed, and roll tightly. Store in an airtight container in the refrigerator for up to 1 week. Or into a freezer-safe container or bag for up to 1 month. These are freezer-friendly. Store in an airtight container or freezer-safe bag for up to 1 month. Fridge - up to 1 week.